I received a call from your Human Resources Department yesterday (Date), and I’m writing you this letter to inform you that I have at this moment officially accepted your offer for the post of (Job Position). (Describe in your own words). It gives me great pleasure to have received this letter, and I at this time assure you of my presence at the interview to be held on the (Date). (Cordially explain your greetings). Your company is one of the most reputed likely ones in the country, and I believe I am enthusiastic and qualified enough to do your expectations justice. 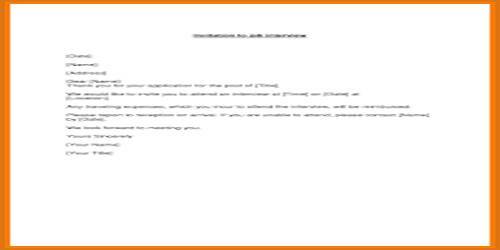 Email Format: The following is an email format to be followed for an interview acceptance letter. This is concerning the interview call letter received on (Which Date Interview Letter Was Received). I acknowledge the receipt of the same and confirm my presence for the interview on (Which Date You Would appear for the Interview). (Describe in your own words). As it is one of the prestigious firms, appearing for the interview will be a matter of honor. (Cordially explain your greetings). I shall be present be at the given time and address, with all the related documents.